18-mesh Zweigart mono canvas - students may provide their own canvas and threads, if color choices offered are not suitable. This class provides an opportunity for students to study diaper patterns and pattern networks in general. 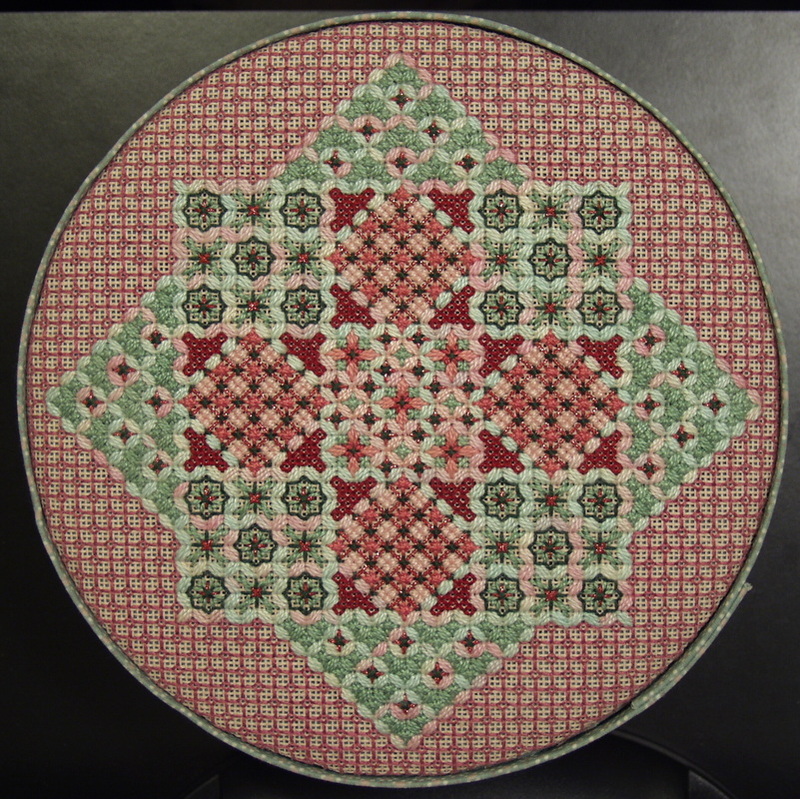 Five different square patterns are combined in a striking nine-patch arrangement, shown here with a Watercolours outline that dilutes the individual patterns somewhat but is stunning in its own right. This outline of Flip-flop Diagonal Hungarian units forms a soft undulating edge that resembles rick-rack. My notebooks in recent years have all focused on innovative types of patterns that have become my trademark. I have always included a brief discussion of pattern networks in general with these courses to encourage students to be more creative with their pattern choices. By taking one network and showing endless variations and combinations, students will learn how to plan original patterns. In addition, they will also learn my secrets to tidy sequences when composite patterns are stitched. Many examples are open networks too so it is important to eliminate or to minimize the visibility of the traveling threads as well. Students will select their own threads and canvas color for this class. Four sample color choices will be provided along with information regarding contrasts and value ranges. The design is executed in floss and pearl cotton with both Kreinik and Watercolours accent threads. My design is mounted as the top of a lovely band box with a coordinated fabric and trim, but the design is small enough to be used as a pillow or as a framed piece as well. PREWORK: Nine-patch framework must be stitched. Estimated Time: 10 hours. 1. To teach the correct identification of diaper patterns. 2. To discuss ways to develop such patterns on canvas. 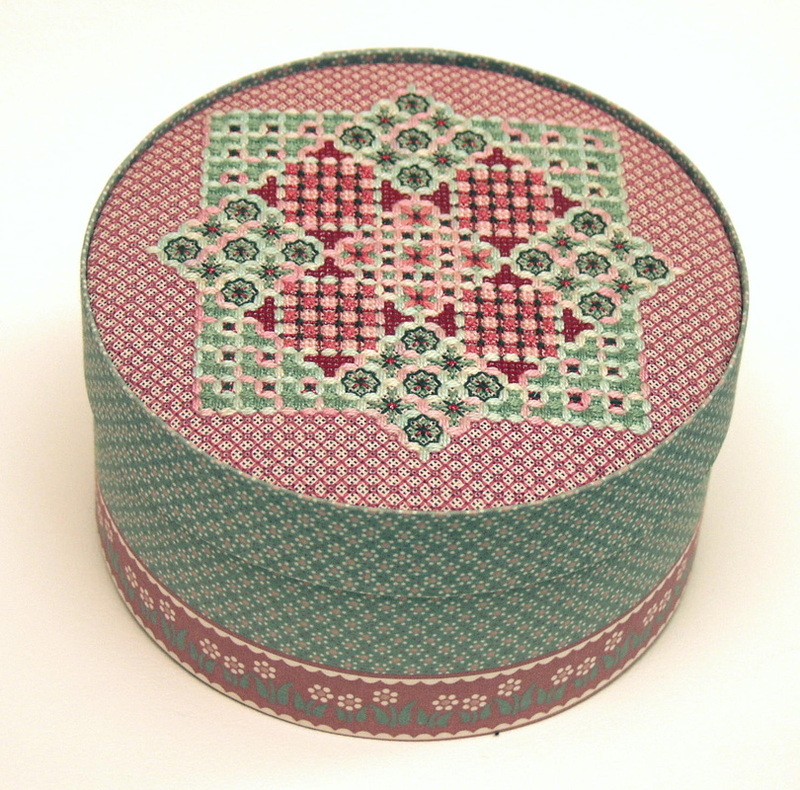 Conventional patterns can be solid Tent or texture stitch arrangements, but many counted thread techniques (blackwork, pulled thread, darning, etc.) can form natural diaper networks. TEACHER PROVIDES: Complete kit. An in-depth essay is also available on this subject as an option for $9.00. This research paper has the endorsement of the Master Craftsman committee and was written as part of my certification research requirements. STUDENT PROVIDES: A 12" stretcher frame, a clamp or weight to secure the frame to a table, two HiLiter pens, a laying tool, and embroidery scissors.